I don't know what is more fun - quilt shop hopping on vacation or discovering new yarn shops. With both stores, I am like a kid in a candy store! 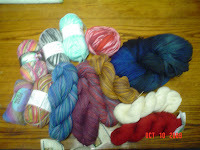 Here is a photo of the yarn I purchased on my recent vacation. We found two very nice yarn shops, one in Port Gamble and one in Sequim. Most of the yarn I bought is for socks. However, I did buy some for fingerless mitts and enough yarn for 2 sweaters. I have finished the socks I started on vacation. They are made from red hand-dyed wool that I found at The Artful Ewe in Port Gamble, Washington. I liked the yarn so much, we returned a few days later to buy more yarn for a sweater. Only there was not enough of that color left for a sweater. So, I purchased some beautiful varigated blue yarn for the sweater instead. It is in the top right hand corner of the photo. It really is lovely yarn. 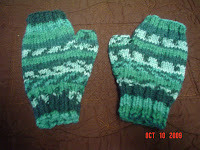 The photo on the top right above, are the fingerless mitts I knit for my granddaughter's birthday. I thought they came out rather nice. I found the yarn at The Dropped Stitch in Sequim. The yarn is Universal Yarn Company's Classic Worsted Tapestry in the color of Emerald.